Hey guys, first post here. Having some trouble. 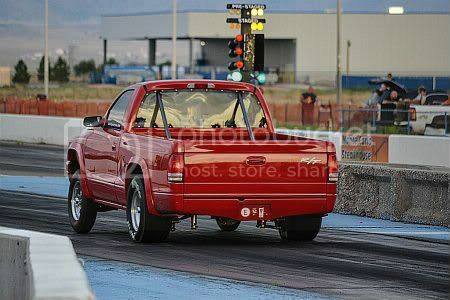 Truck is a 99 R/T extended cab. Factory cylinder heads cracked. Decided to replace with Enginequest assembled heads. Heads seemed great when I unboxed them, valves sealed nicely and held carb cleaner. Problem is, when I torqued down the rocker arms all of the valves are slightly held open. Checked with cam off lobe at TDC to be sure, valves never close. All other parts in the motor are stock. Pushrods measured out to 6.9". Called Enginequest. They advised me to install the lifters completely dry. I gave it a shot, disassembled every lifter cleaned then put them back together dry. This worked for about half the cylinders, but the plungers on the lifters are almost completely bottomed out. On the other half the plungers are completely bottomed out and the valve is still cracked open off cam lobe. Yes. Headgaskets installed and torqued to spec. I experimented today with shimming the rocker arms with some washers. I ordered a rocker arm shim kit and I think I can get it dialed in with that, when it comes in. Always measure for pushrods. Period. Are these the OE rocker arms, aftermarket? Rocker arms and all other parts are stock. Pushrods are stock length. Everything worked together with factory heads. Although I didn't pay any attention to how squished the lifters were, it was a running truck. Motor came from a wrecking yard about 3 years ago. Factory heads had a tag in the freeze plug that said warranty void if removed, so I assumed they had been rebuilt. Overheated after a large hole was made in the radiator. Had symptoms of bad head gaskets. Tore apart and found heads cracked between valves in six cylinders. Live local to EQ warehouse. Called them up, they gave me a great price, so I went that route. What I did find is that shimming the rocker arm just .060 made about a quarter inch difference in pushrod length. So if the pedestal mount locations on these heads were just slightly off, it could cause big differences in pushrod length. I ordered a rocker arm shim kit with various sizes that I can try till I get the lifter preload just right. This might not make for the best rocker arm geometry, but is a fraction of the cost of new pushrods. Also with a stock low lift cam the rocker arm angles can't be too extreme anyways. Allow me to be Captain Obvious and no disrespect intended but you didn't tighten them too much right? There is a sequence to this and your push rods should be at their lowest point when tightening. Your cam should be on base circle with both valves showing closed. Hand tighten them before you torque them down as you have to obtain "zero lash" first before torquing. Notice how many turns it takes to reach 18-20 ft Lbs. If not, keep shimming until you do. Sometimes it only takes another 1/4 to 1/2 turn. Last edited by arro222; 04-11-2019 at 04:51 PM. This could be an issue. I rotated the crank till the v8 was at 0 degrees. Hand tightened all. Then went to torque to 21 ft lbs. Torqued wrench clicked right away, realized I hand tightened a little too much. Backed all bolts out and frightened to 21 ft lbs. Could I have actually squished these pedestals enough to cause an issue? Went to the self serve junkyard today. Checked out several other 5.9/5.2 motors. All rocker arms were torqued more than 21ft/lbs. Purchased a pair of rocker arms. Installed them on my motor, made no difference. So overtightening is not the problem. Shims came in the mail. Working on shimming right now. Seems to be working. About how much lifter preload? Was what I told from Enginequest, that Magnum engines should have there lifters installed dry true? Sounds crazy to me. I doubt it. Do not think that because you used stock replacement heads, that they were cast the exact same way. In my mind, no head should be bolted on out of the box w/o going over tolerances. It is not uncommon to adjust preload dry. Some believe an oil filled lifter will act as a solid lifter. At any rate, your preload should be in the .020-.060 range. Some Mopar guys have set theirs at .080-.090 to get rid of noise. Ordinarily, The only reason you might need different length push rods is if your heads have longer valves, different ratio rockers, camshaft replacement, had the heads or deck milled, different springs, thinner or thicker head gaskets, or a combination of all those. I know you're trying to save money but there are a ton of unseen circumstances with any engine work. There are minimum tools to acquire when doing this stuff and an adjustable push rod length checker for under 15 bucks and a micrometer would have come in handy. Last edited by arro222; 04-18-2019 at 05:14 AM. Just wanted to give an update. Had to shim the rockers .070. Preload on the lifters ended up being about .060. Truck runs great now. I did check the pushrod length. I would have needed pushrods about a 1/4" shorter. I went the shim route because it was much cheaper than 16 new pushrods. I already spent extra on these heads over factory rebuilds, so I didn't want to spend anymore money. Just want the info out there. If you buy these heads, definitely plan and budget for pushrods.